Are you messed up with the thought of how to choose the best dog for your family? If the answer is a big YES then you should try and get to know some important points that can help you in choosing some of the best dogs for your family. It is very significant to make the choice of a pet dog wisely. Dogs should always be chosen keeping in mind their temperament and their habits. They should serve as a perfect match for their masters and therefore some points have been enumerated below that will help people in choosing the best dog. A family with children should always consider getting a dog that has a very friendly and even temperament. The dog chosen should be naturally good with kids and should possess a playful nature. Big disasters might take place if a family with children ends up choosing a dog that has an aggressive nature. The space that is required by the dogs to live largely depends on their exercise requirements and their level of activity. A dog that is energetic and large would require a very large space for its exercises while a dog that is small can be easily kept in houses that do not have ample space. Therefore it is important to consider the space within the house before choosing a dog for the family. There are dogs of different nature. There are dogs that are very sociable while there are some dogs that do not like to socialize. 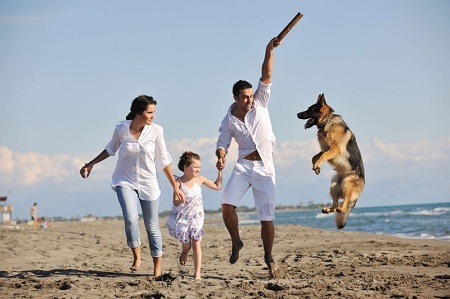 The energy level and the activity level of the dog that is chosen for the family should match with the energy level and the activity level of its owner. It is important for people to have a very clear idea about whether they would be able to take their dogs for a walk or play. These points should always be kept in mind while making the choice of dogs. The grooming requirements of the dogs should also be considered before making their choice. For example, long-haired dogs require brushing on a regular basis. In fact, it would become complementary to take the dog to the salon for grooming. Therefore, it is important for people to consider whether they would have the time to do all this and then they should make their choice of pet dogs. The budget is also important in this respect. It is always necessary to carry out proper check-up before making the choice of pet dogs. Sick dogs can turn out to be very expensive because they require regular treatments and medicines. Pet insurance cost is also an important consideration. Therefore people must make sure that they would manage the expenses of the veterinary before making the choice of a pet dog. These are the points that should be taken into account while wondering how to choose the best dog for your family.